Customerized Materials are welcomed and workable at our factory. 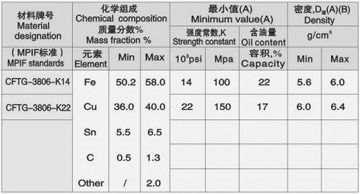 Customer please offer the chemical composition (%) for the target material. 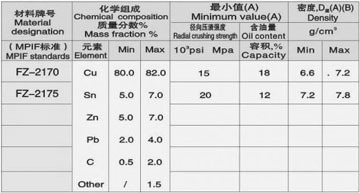 This alloy can be used for products combining structureand features of bearing. Less rotation noise compared with iron base. The alloy is harder and of higher strength than bronze,as well as better oscillating load ability. The participation of carbon helps enhance the abrasion resistance and compression strength of the iron/copper alloy. 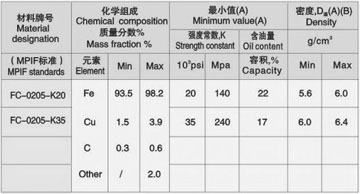 Mechanical property can be improved through thermal processing. 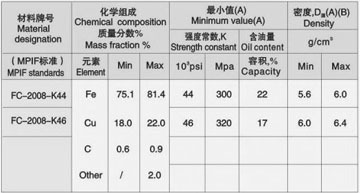 The iron, copper & carbon alloy proves excellent mechanical property. 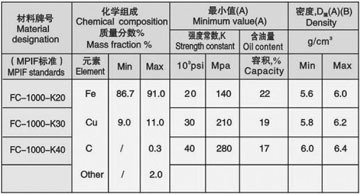 Poor stability due to great heat exposure variety during manufacturing, but excels in strength. Wildly applied to industrial machinery. 1. The alloy base of iron, copper and tin has improved strength and abrasion resistance. 2. Resembling bronze bearings in excellent mechanical property.